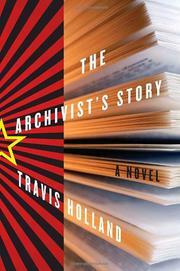 Holland offers an elegiac tale of life in Soviet Russia in his debut novel. When Isaac Babel was arrested by the People’s Commissariat for Internal Affairs in 1939, his archives and manuscripts were also seized by the Soviet government. Like their author, these documents disappeared. In his quietly magnificent debut, Holland creates a Soviet functionary to rescue a few of these lost tales. Pavel Dubrov’s job description is “archivist,” but his duties as a preservationist only go so far as cataloging the seized manuscripts of writers interned in Lubyanka prison so that their words can be used as evidence against them; after this, the manuscripts are burned. Pavel accepted this job because it was a means of survival, but an encounter with Isaac Babel, an author he reveres, renders the job intolerable. Babel has been writing while in prison, and Pavel determines to rescue these new stories. This act of rebellion makes Pavel simultaneously more afraid and less afraid—more certain that he will be denounced and less concerned about being denounced. It brings him back to life and seals his doom. Holland has an unassuming, unadorned style, and he composes his story on a human scale. He contemplates the meaning of memory and the nature of truth without subjecting the reader to philosophical lectures; instead, he shows what happens to individual souls under a fascist regime. He offers no grand dénouncement of Stalin because none is needed: The mundane horrors his characters endure speak for themselves. It’s one of the great strengths of this novel that Holland does not romanticize the value of literature. There is no suggestion that art is worth more than a human life, that it is better to save Babel’s stories than it would be to save Babel himself. Pavel’s triumph is a small one, one that glows in the shadow of a much larger tragedy. A historical novel of subtle power and tremendous grace.